Resin and Stone Mix - Cross & Couple Cake Topper 7"H. Rose pattern filigree, rhinestones. 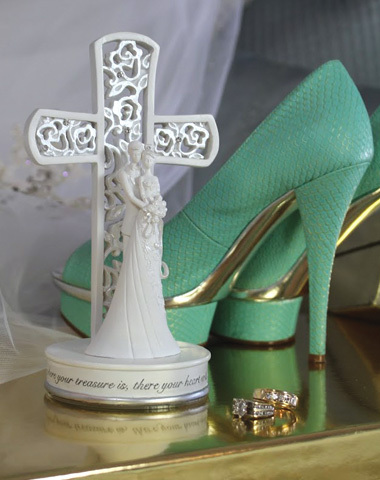 This unique wedding cake topper features the bride and groom standing in front of a beautiful pierced filigree cross. This piece is versatile in that it can be placed on a wedding cake or given as a beautiful gift! Wedding Cake Topper is also a stand-alone collectible.